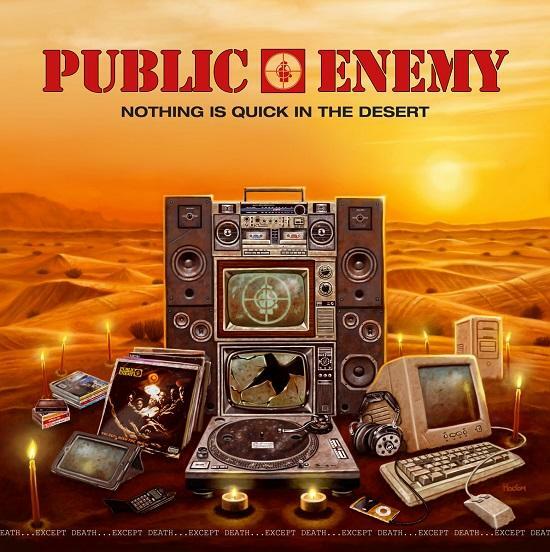 Public Enemy's new album is called Nothing Is Quick In The Desert, and available for free now on Bandcamp. The album, which was surprise announced earlier this week, features guest appearances from Ice-T, PMD of EPMD, Easy Mo Bee, Sammy Vegas and Solé. The group's Chuck D said in a statement: "Nothing Is Quick In The Desert is a saying I use when the average person looks at the record industry. It looks dead like a desert. But there's plenty of life in the desert when one is educated on what they see and hear. "There, a cactus absorbs and stores water deep in its root, taken from the air itself and certain creatures thrive in that dry heat whereas the average cannot. It pays to be above average (or well below it) in the desert for survival. The music industry is similar in that analogy. It's still in motion, it just needs redefinition."